Between two Scorpios there is a power struggle. Both want to have responsibilities, you attract each other, but you are too possessive to each other. There are problems, but not financial ones. Together you can be successful in business, and tend to bypass the sentimental relationship, reaching an abundance of money and responsibility. 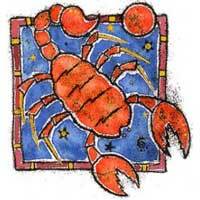 Alongside a Scorpio, you strive for success and you will succeed in achieving the objectives that you pursue. Scorpio man will not be satisfied but with what is best at his partner, and usually says what he thinks. He has the ability to see clearly when you attempt to fool him. Do not try to change him, because he will realize what you are doing. If you want to lose him, it is enough to start criticizing the manner in which he talks. If you want to keep him, try to understand, cooperate and put yourself in his place from time to time. The physical side of Scorpio man is very developed, but the emotional side needs love in a poetic way; he is brutally honest. He will make you aware of the fact that he is happy with what you give him; in many cases, if Scorpio woman is happy, then he is happy. Scorpio woman will have to be patient and sincere, make them confident, respectful. If she does this, he will be very thankful and will do anything to please her. Scorpio can be a very jealous man, if you like him, you will need to pass many tests. Scorpio woman has the emotional side very developed and she is very sweet. She's ready to forget the past, to begin a bright future. She is mysterious, and is a human lie detector. It is better that she knows the truth whatever it takes, because she will find out anyway. She is dynamic, explosive, exciting and very loyal. Do not get involved in a relationship with a woman Scorpio if you are not strong and ready to make small adjustments mentally and emotionally.